Quartermaster.me, the up and coming startup in the world of digital Yacht Management announced today the launch of their flagship cloud application. 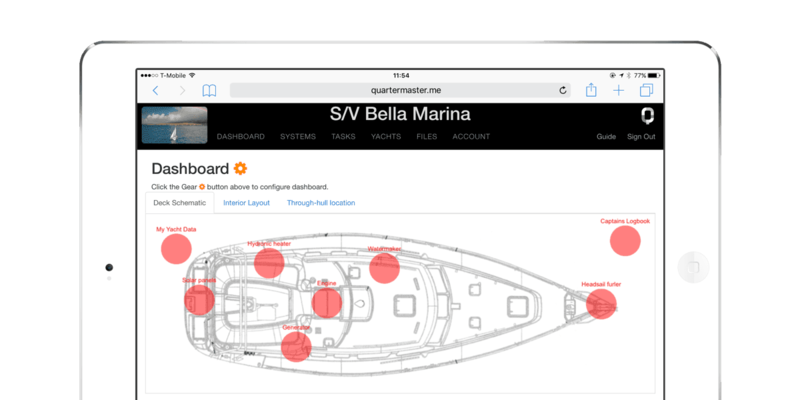 Quartermaster is a comprehensive yacht management software solution that helps you organize all of your yacht's data in one place. It provides an easy to use dashboard to organize your yacht's systems, an electronic logbook for your log entries, a way to track services needed for each system, a task board to track your 'to-do' list, and file storage for your manuals, documentation and receipts. "We are thrilled to offer the best and most intuitive solution for yacht owners and captains, and enable them to spend more time on the water and less time dealing with last minute maintenance issues", sais Petter Bergman, co-owner and CEO of Quartermaster. "Our deep passion for yachting and building great software keeps the focus on the yacht owners' needs, and unlocks the potential for great innovation in the space. It's an honor to serve the community we have been a part of for so long." Quartermaster was born when Petter and Octavia, the yachting power couple co-founders decided to build a solution for a need they noticed as soon as they bought their sailing yacht Bella Marina. They used their decades of experience designing and building software in Silicon Valley to bring the most intuitive and complete application to yacht owners everywhere. Quartermaster is a comprehensive cloud-based yacht management solution for yacht owners and captains with a mission to help every customer to be the best yachtsman or yachtswoman and spend more time on the water and less time worrying about maintenance. By facilitating the organization of all logs, systems, maintenance, and records in one place, Quartermaster helps yacht owners everywhere work hard and play harder on the water.